The first stone of the cathedral was laid on August 15, 1858 by Archbishop John Joseph Hughes but the work was soon suspended due to the Civil War and resumed only in 1865. 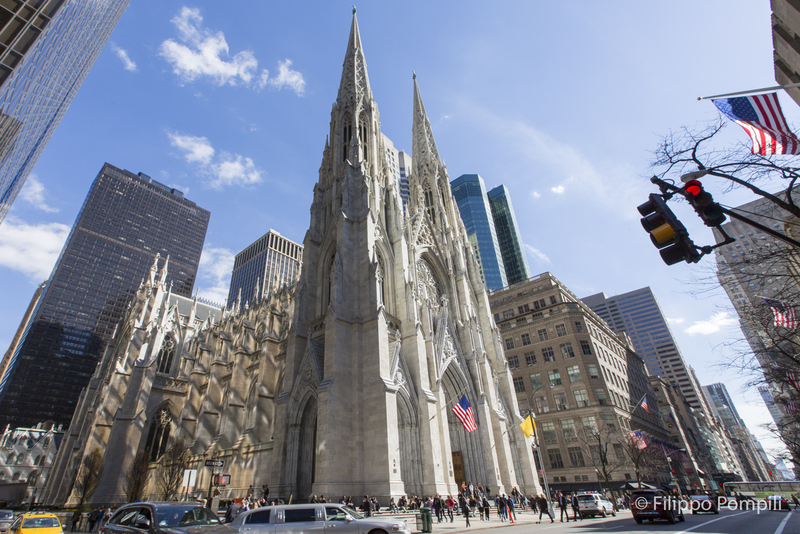 It was inaugurated and consecrated on May 25, 1879 by the archbishop of that time, Cardinal John McCloskey and dedicated to St. Patrick, patron saint of Ireland, becoming the bishopric of New York. The building was built in stone and marble in the Gothic style on the basis of the project of the architect James Renwick Jr. The bronze doors have bas-reliefs that reproduce the effigy of distinguished American Catholics. The archbishop's house and rectory were added in 1880, both works by James Renwick Jr. while the spires were added in 1888 and with their over 100 meters became the tallest structures in New York. An addition to the east, including the Lady Chapel, designed by Charles T. Matthews, was built between 1901 and 1906. The Lady Chapel’s windows were made between 1912 and 1930 by an English artist and designer Paul Vincent Woodroffe. In 1927 and 1931 the sanctuary was extended and the large organ installed. In 2012, a major restoration program was launched, costing $177 million and completed in 2015. In 1964 it was visited by Pope Paul VI, in 1979 by John Paul II, and in September 2015 it was the turn of Pope Francis. Here were celebrated the funerals of the nine Archbishops of New York, the famous baseball player Babe Ruth, Senator Robert F. Kennedy, the Governor of New York Hugh Carey along with many others. The Cathedral is 124 meters long, 53 meters wide and the height of the spires is 101 meters. It can seat about 2,400 people, has 19 bells and its main organ has 7,855 pipes. The rose window has a diameter of 8 meters, the bronze portals on 5th Avenue weigh over 4,082 kg each.